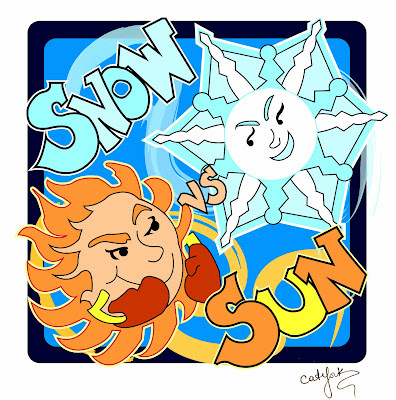 It's In The Details: Sun versus Snow Query Contest Logo! Here is the logo for Sun versus Snow! Doesn't it fit the contest perfectly? Thanks to Amy Trueblood for inviting Cat York to help us out with her terrific artwork. She really caught the theme. I hope you're all polishing those manuscripts and queries so Santa can bring you a spot in Sun versus Snow. You don't want to be on the naughty list. If you're looking for all the details about Sun versus Snow check out the announcement post here. But we will be accepting Adult, NA, YA, and MG genres. You'll send your most fluffiest query and your frostiest first 250! To enter to win a free pass into the Snow picks, go here. I'll paste the rafflecopter here too. I'm really excited about this new contest. I'm not sure I'll quit be ready with the new project (polishing now), but this looks like so much fun! Looking forward to this one! I'll put a post up on my blog soon. And I'm only a couple chapters in to Kindar's Cure, so can't do a review yet, but I'm enjoying it so far. And I like snow because it's beautiful, sparkly, and NOT HOT. No offense to Amy's hell but I just can't handle the heat and bugs of summer. Heehee. Snow all the way! I like snow, but only at Christmas and really only to look at or play in for a few days. There's nothing better than a white Christmas. The contest sounds like fun -- and a great way to kick start the query process.